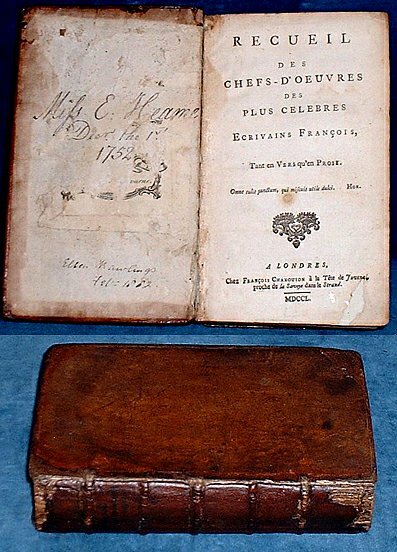 Title: RECUEIL DES CHEFS-D'OEUVRES DES PLUS CELEBRES ECRIVAINS FRANCOIS Tant en Vers qu'en Prose. Description: London, Francois Changuion a la Tete de Juvenal 1750 . Octavo gilt-ruled 18th century calf, spine on 5 cords (leather worn/lacking at corners and head/foot of spine, hinges held but starting to split) lacks front endpapers, iv +535pp +p corrigenda. Various early ownership inscriptions and remains of a bookplate on pastedown, tear at foot of title just touching text, a few other marginal tears without loss else French text clean and crisp throughout. *Collection of French works starting with Telemaque, Gil Blas, l'Avare de Moliere etc.